Well, today I started building my bike. 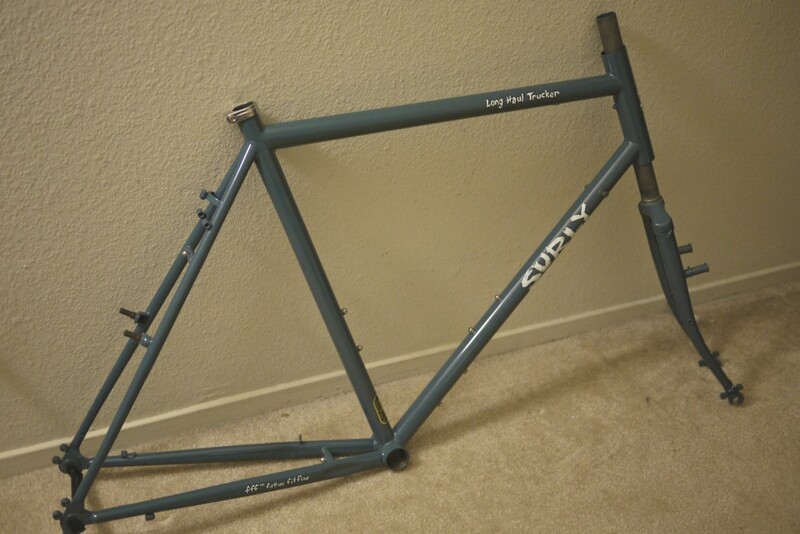 Here is the frame I got off of Craigslist. Made by Surly, it’s called the Long Haul Trucker. This frame is made specifically for long distance bike touring. The frame is made out of welded steel, it has lots of brazed-on places to attach things like racks, baskets, water-bottles and other gear, and the geometry of the frame is designed to be stable while carrying heavy loads. It’s no speed demon, and it’s a bit heavier than most modern bikes – but it should take many miles and many years of abuse – I just hope I get the chance to put that to the test. I originally had planned to choose a frame from the Bike Kitchen, but as time went on I wasn’t sure that was the right decision. They have some decent frames there which would surely last me for a while, but I just didn’t fall in love with any of them. I wanted to build a bike that could travel with me, something that felt really special. So instead of finding all my parts at the Bike Kitchen – I think I will mix and match. I will first look for parts at the Bike Kitchen, but if I can’t find something that satisfies me, I will look elsewhere.